As term begins we will are all dealing with the realities of working and studying in a sector that has been increasingly subject to destructive market pressures. This includes the rampant growth of casualisation in our Universities – with almost 60% of staff at Goldsmiths reported to be on such precarious contracts. The result is that many of our lecturers are working in extremely insecure conditions, underpaid, and without access to basic resources such as offices and equipment. 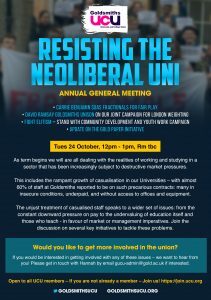 At this meeting we will be hearing from the FFFP campaign at SOAS in order to learn from their hugely successful campaign to improve pay and conditions of casualised staff. The unjust treatment of casualised staff speaks to a wider set of issues: from the constant downward pressure on pay to the undervaluing of education itself and those who teach – in favour of market or management imperatives. Join the discussion on several key initiatives to tackle these problems –the joint campaign with UNISON to increase London weighting paid to staff at Goldsmiths; the Fight Elitism Campaign to defend our BA Degree in Applied Social Science, Community Development and Youth Work BA and the Gold Paper initiative to democratise our university. Would you like to get more involved in the union? If you would be interested in getting involved with any of these issues – we want to hear from you! At the AGM all positions in the branch will be up for re-election. Whether it’s working on equalities, becoming a department rep, or tackling casualization – please get in touch with Hannah by email gucu-admin@gold.ac.uk.